My fleeces from Lee in Australia finally arrived - they are *gorgemous*! Even with holiday houseguests over I had to open my bag of merino goodness right away. Thankfully as a fellow artist Charlie understood that I had to touch it immediately and didn't seem to mind when I had covered the living room floor in fleece. 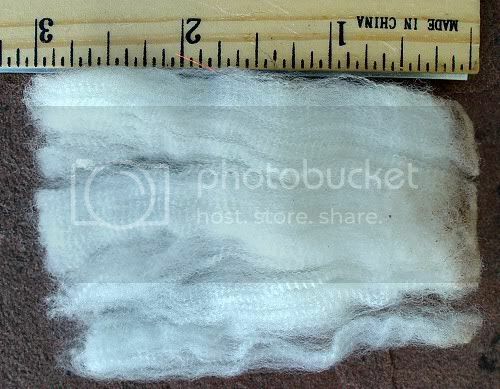 The shorter one is ~16 micron, and is simply the most spectacular fleece I have ever had. Which does include that Estes & Taos GCh fleece (sorry Clyde!). I have to say that again - 16 micron!. See that little bit of dirt on the tips? That's it.The rest of it is spotlessly clean and white. Clean enough to spin right from the lock. And sooo soft. This fleece is very worth the wait and shipping costs - you cannot find this kind of fleece in the US. The longer one is ~17 micron with a 4" staple. 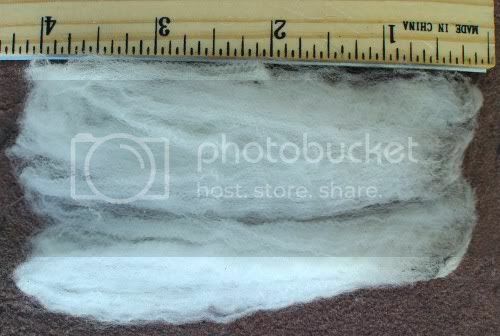 It has just a little dust at the tips too, and is as lovely as the first fleece. These fleeces have no VM. Did I mention the 4" staple? Both of these fleeces are almost indescribably wonderful, but with the longer staple length this one is perfect for practicing my crazy-invisible-uber-cobweb spinning with. I've been toying with the idea of entering the Longest Thread competition in 2007 - this would be the perfect fleece to work with. Perhaps others from spinningfiber would like to join in and we could submit a guild entry. Anyways, I just had to share how great this stuff is. And I have *pounds* of it. Muwhahahahahahahaha!